This page describes a “reference deployment” of all StackStorm components installed on a single system. It explains what the main components are, their role, and how they are wired together. “st2” services provide the main StackStorm functionality. They are located at /opt/stackstorm/st2, share a dedicated Python virtualenv, and are configured via /etc/st2/st2.conf. st2sensorcontainer runs sensors from /opt/stackstorm/packs. It manages the sensors to be run on a node. It will start, stop and restart based on policy the sensors running on a node. st2rulesengine evaluates rules when it sees TriggerInstances and decides if an ActionExecution is to be requested. It needs access to MongoDB to locate rules and RabbitMQ to listen for TriggerInstances and request ActionExecutions. The auxiliary purpose of this process is to run all the defined timers. st2actionrunners run actions from packs under /opt/stackstorm/packs via a variety of Action Runners. Runners may require some runner-specific configurations, e.g. SSH needs to be configured for running remote actions based on remote-shell-runner and remote-command-runner. st2resultstracker keeps track of long-running workflow executions, calling the Mistral API endpoint. st2notifier generates st2.core.actiontrigger and st2.core.notifytrigger TriggerInstances on the completion of an ActionExecution. The auxiliary purpose is to act as a backup scheduler for actions that may not have been scheduled. st2garbagecollector is an optional service to periodically delete old execution history data from the database, per settings in /etc/st2/st2.conf. st2auth is an authentication service with a REST endpoint. A variety of authentication backends are available; see Authentication for more details. The reference deployment uses flat file auth backend. st2api is REST API web service endpoint, used by CLI and WebUI. It also serves webhooks for webhook triggers. st2stream is an event stream consumption HTTP endpoint where various useful events are posted. These events are consumed by WebUI and hubot i.e. ChatOps to update with results etc. st2client is the CLI and Python bindings for the StackStorm API. To configure the CLI to point to the right API, authentication options, suppress insecure warnings for self-signed certificates and other conveniences see the CLI Reference. st2client is packaged with st2, or can be installed independently. Mistral is a workflow service component that StackStorm uses for long-running workflows. It is packaged as st2mistral, installed under /opt/stackstorm/mistral, runs in a dedicated Python virtualenv, and is configured via /etc/mistral/mistral.conf. mistral-server runs workflow logic and calling actions, reaching out to st2api for action execution requests. st2mistral is a mistral plugin with stackstorm extensions. mistral-api is an internal end-point accessed by st2actionrunner and st2notifier. In a single-box deployment it is restricted to localhost. nginx provides SSL termination, redirects HTTP to HTTPS, serves WebUI static components, and reverse-proxies REST API endpoints to st2* web services. StackStorm WebUI (st2web, and Workflow Designer, for Extreme Workflow Composer) are installed at /opt/stackstorm/static/webui and configured via webui/config.js. st2web comes in its own deb and rpm package. Workflow Designer is deployed as part of the bwc-enterprise package. They are HTML5 applications, served as static HTML, and call StackStorm st2auth and st2api REST API endpoints. NGINX proxies inbound requests to /api and /auth to the st2api and st2auth services respectively. 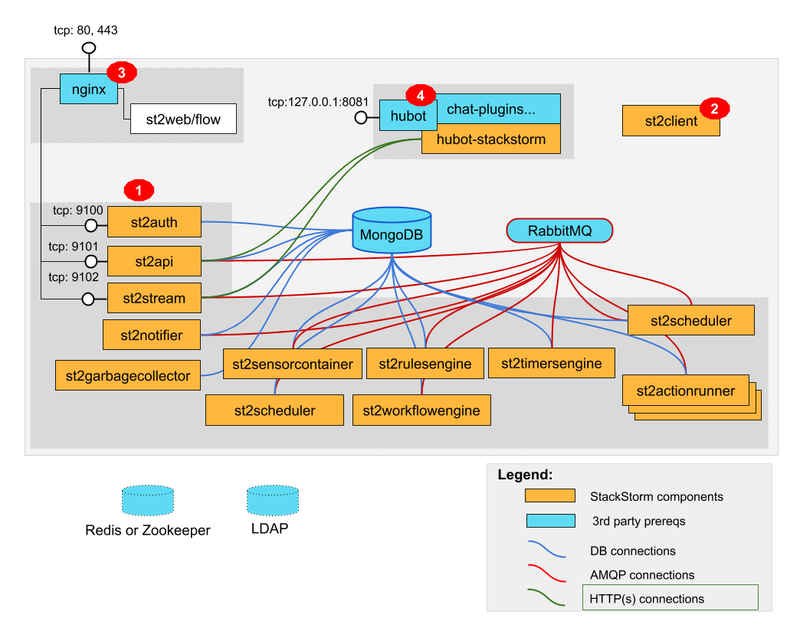 StackStorm Chatops components are Hubot, |st2|’s Hubot adapter, and plugins for connecting to different Chat services. They are packaged as st2chatops, installed at /opt/stackstorm/chatops/ and configured in /opt/stackstorm/chatops/st2chatops.env. ChatOps can be also enabled by installing hubot-stackstorm plugin on your existing Hubot instance. nginx for SSL termination, reverse-proxying API endpoints and serving static HTML. Redis or Zookeeper for concurrency policies (see Policies). LDAP for Extreme Workflow Composer LDAP authentication. For specific information on multi-box deployments to achieve HA or horizontal scale see High Availability Deployment and StackStorm HA Cluster in Kubernetes - BETA.